See you in Saint Louie, Screwie! I’m heading down to Saint Louis on the weekend of the 17th to check in with my father; he has been having a few health problems so I decided to visit. I’m excited to note that my visit coincides with the opening of the new BWorks building on Menard in Soulard. BWorks is a not for profit that works with kids, teaching them life skills, helping them build self confidence and giving them mentoring opportunities — they concentrate on teaching kids to repair and refurbish bikes, learn stuff about computers and write and illustrate and publish their own books — bikes, bytes and books! 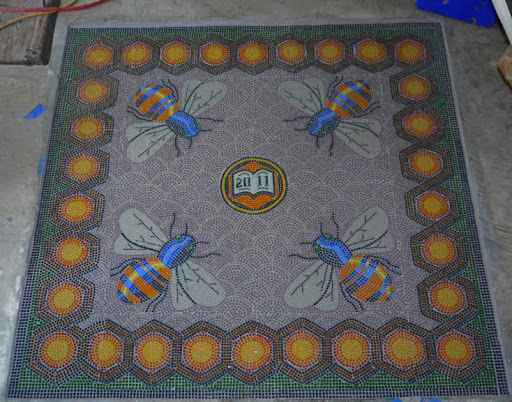 They hired me to make the mosaic in their entry; the bees are symbolic of their mission. I am 90% sure I can be there at the ribbon cutting on the 17th; if you are in town, stop by! Details at Bworks.org. This is a mosaic floor I made for a non profit in Saint Louis, MO named BWorks. The floor measures 6 foot square and the bees and hexagons are symbolic of their mission. 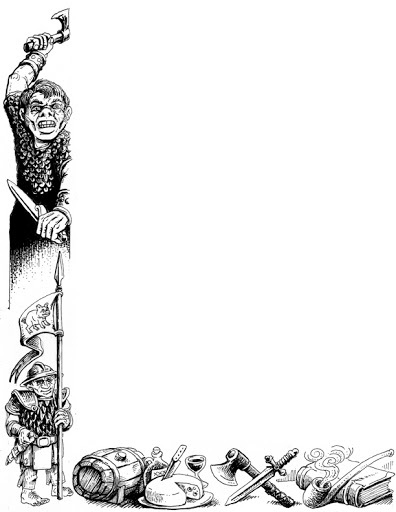 Illustration for the DCC RPG. I’m limiting myself to displaying the images that Goodman has already shown the public; there will be more pictures in the book coming out later in 2011. 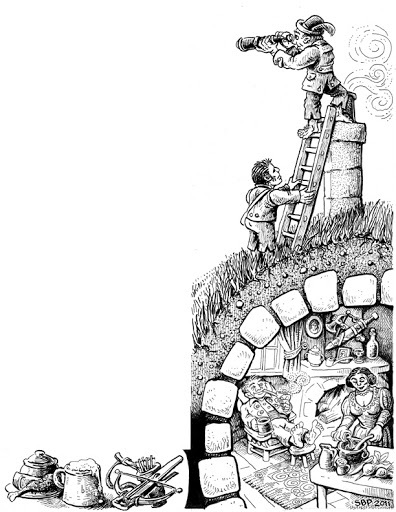 These two pictures are ‘marginalia’ for the Halfling class and fit around the text like a border in the DCC book. 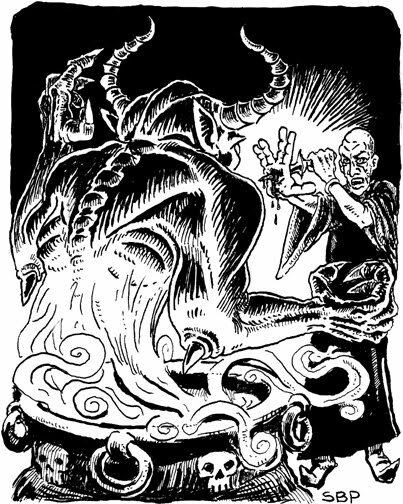 In the DCC RPG, spell casters can make deals with powerful demons, etc., for more power. 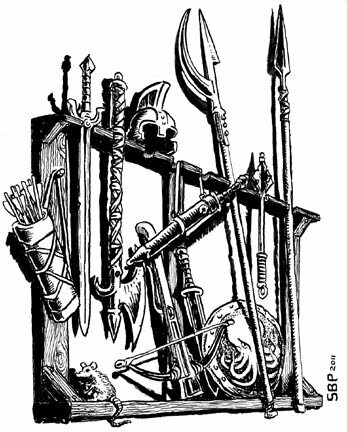 Tomb raiders from the DCC RPG. 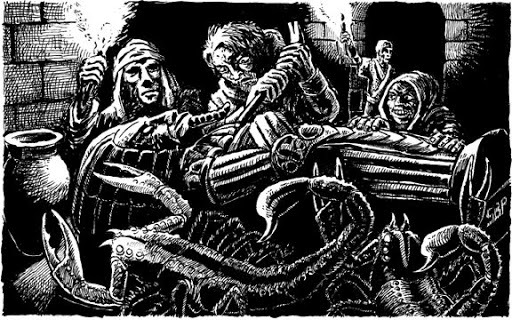 They have not yet noticed the scorpions creeping up behind the sarcophagus they are attempting to despoil. I’ve been putting in long hours on a mosaic tile floor as a part of a commission at a non profit in Saint Louis. I hope to finish today. This is a pic that was snapped by someone’s smart phone; I plan to take better pics before I go… but the project means sore hands, sore knees, a sore back, etc. The ‘Exquisite Corpses’ book is still in production, but I have hit some creative blocks / snags on my end so things are not progressing as fast as I would like. 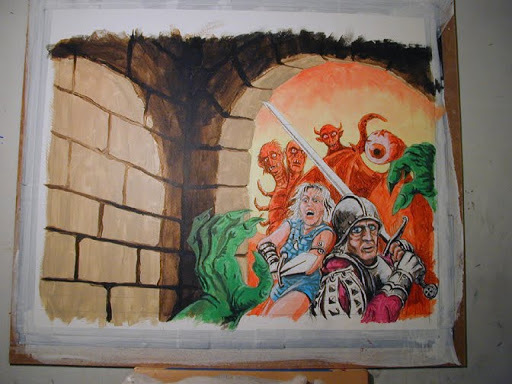 A proposed and half finished cover image is at right (this was supposed to be a wrap around with the dungeon wall on the back cover serving as a background for text and the adventurers and monsters on the front cover). Since starting the painting at right, I’ve gotten what I think is a better idea for a cover image… so this one has been mothballed at this point. I’ve had a few private commissions I’ve been working on, including some fantasy/rpg pieces which will hopefully see the light sometime in the near future. One set of paintings I did at the end of the year last year still haven’t been published, so I am waiting before I can display those… but I wish they would hurry up and publish so I can show off the paintings… I was pretty happy with how they came out. Hopefully I’ll eventually get to show them off in my illustration portfolio (www.stefanpoag.com). I’m also working on a BIG mosaic floor that is supposed to be installed sometime this month(www.stefanpoagmosaics.com)… which is coming along great but needs a lot of work. It’s about 6’3″ square (it was originally 6′ square but an error by the builder added 3 inches — ouch!) and features images of bees, colorful honeycombs/hexagons, etc. I post pics later when I get it in a more presentable state. Finally, I’ve been recruited to do all sorts of home improvement projects, including a large vegetable garden with an 8′ high wire fence to keep the deer from eating all the plants. The fence is up — although it needs more posts… the sheer weight of all of that wire fence is causing the fenceposts to sag a bit. That surprised me — the posts are weather treated wood that are about 4×4 thick…. but this is my first ‘Stalag 13’ style fence so later this summer I’ll be planting more posts (sigh) and now I have to come up with an irrigation system that won’t make the vegetables cost too much due to the huge amounts of water we will need. So I’ve been busy. Happy Saturday. Gotta go get to work! Longtime readers of this blog will remember that last year I posted photos of a tile floor I was working on in our home. 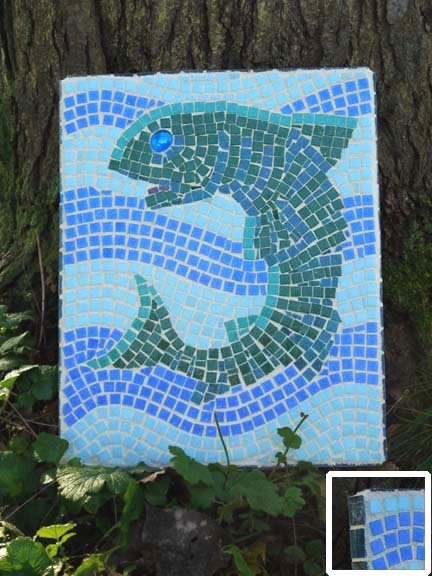 I managed to finish the floor late last year and, due to some interest in my mosaic work, I am now trying to do some tile work paying clients and for sale in galleries and shops. The fish bones (above) is currently serving as a ‘backsplash’ for our kitchen sink (maybe I should photograph it on the sink, but then I would have to clean the kitchen). 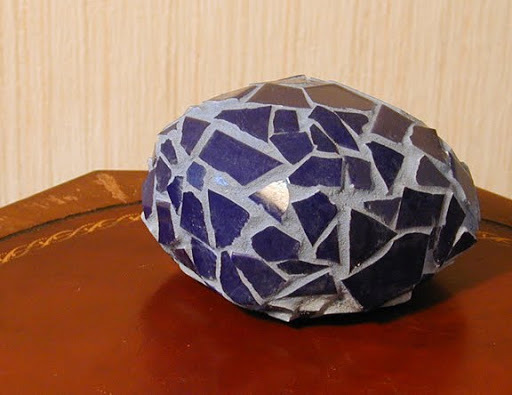 It is made from recycled tile in white, blue and cobalt and measures about 3.5′ long x 12 inches high. My S.O. really likes this one and swears that it looks much better in person. These are flower pots and saucers. A friend has a small shop in a “cottage town” in Northern Michigan where they sell all sorts of items that people use to make their cottages and vacation homes more comfortable and pleasing. I’m hoping that fancier flower pots will appeal to the buyers. I plan on offering these in different colors. This is a bird bath (obviously). I would have preferred to shoot it outside but the light is terrible and there is a foot of snow on the ground, so here you go. 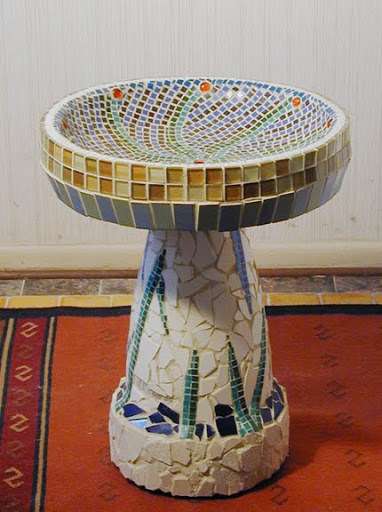 The pedestal and bowl are covered in various recycled tiles and mosaic tiles. Combining the two types of tile is tricky since they are different thicknesses. I have to build up layers of thin glass tile underneath the thinner mosaic tiles. Here is a close-up of the bowl of the bird bath. The design was inspired by photographs I saw of tile work in a medieval mosque in Spain. I had the idea of covering round ‘river rocks’ in tile and allowing gardeners to place them in the garden as colorful sculptures and plan to offer them in different sizes, shapes and colors. 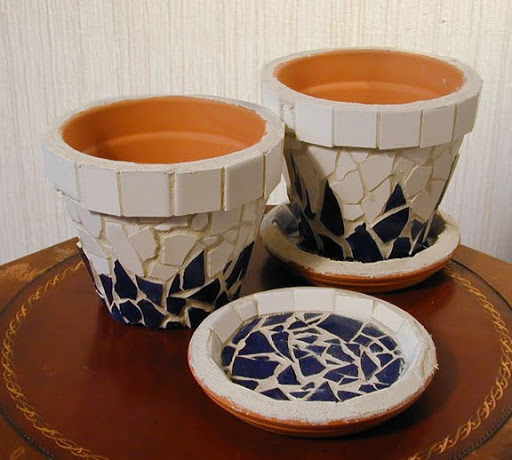 This one is covered in recycled cobalt blue tile but I’d like to offer them in other colors; red, yellow, etc. Again; I’d prefer to shoot it out in the garden but will have to wait till spring. You could also use this as a doorstop, paperweight or catapult ammunition. The rock is a fair sized one; about 7×5″ and weighs 5-6 lbs. I think the appeal of the object will become more obvious when I get a few of them in different colors and can photograph them in the garden. This, of course, is the tile floor that started it all. 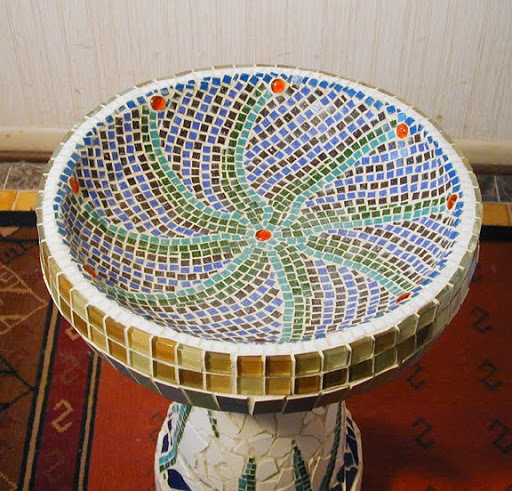 It measures about 12′ x 6′ and is made of recycled tile and glass mosaic tile. 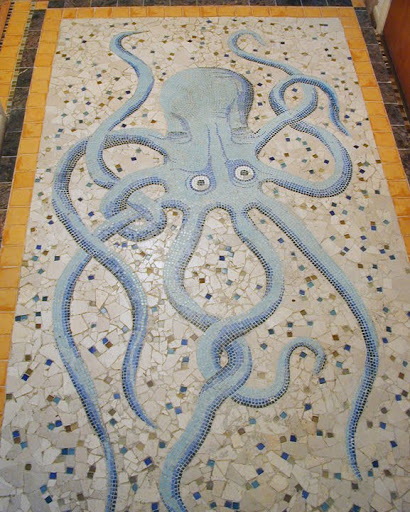 Since the tiles are different thicknesses, I had to build up layers of tile and Masonite beneath the octopus so it would end up level witht he much thicker marble and ceramic tile around it (the marble and ceramic is almost 1/2 inch thick whereas the glass mosaic is ~1/8th inch thick; quite a difference!). Right now I am discussing a commission involving a tile floor in another location.